The problem with this code though is that this is only for Silverlight and Windows Phone. If you are cross-compiling for multiple platforms and want to run on WPF this wouldn’t work. It’s also not pretty that you have to inherit from SilverlightTest, remember to decorate the class with [Asynchronous] as well as calling TestComplete. Even worse, if you forget to stop the timer, it would CRASH the entire test run. The unit test framework is a little flaky when it comes to a task accidentally completing twice (instead of reporting it as an error, it crashes the entire test run and you’ll never get your daily test report…). Wouldn’t it be nice if the unit test I just wrote for WPF would work as is in Silverlight and on Windows Phone? Of course you could create a SilverlightTest class that has an empty TestComplete method, define an AsynchronousAttribute just for fun, and sprinkle a compiler conditional around the void/Task return type, but that just feels messy to me. 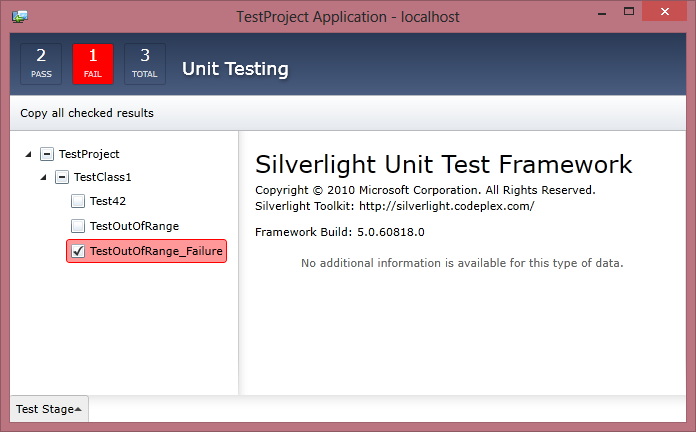 Fortunately the unit test framework for Silverlight is open source, so it’s possible to hack it in there. There are two main places you will need to change, which I will go through here. Note this is based on changeset #80285. Basically it grabs the task that is returned and calls the code that TestComplete would have called or what a raised exception would have called in case the test raises an exception. Also note that we changed the signature of the method to give us the CompositeWorkItem we need to raise these events on. This change does affect quite a lot of other code, but it’s merely a matter of adding the same parameter there as well, and the only place that calls this method (which is the CompositeWorkItem) to set this parameter to ‘this’. To make it easy on you, you can download the modified unit test framework source here. Over the last few months several other people have been writing blog posts covering the transition from WPF/Silverlight/WP7 to WinRT. Below are some of the ones I’ve stumbled upon. An app that reuses code across 3 different XAML platforms and compiles for all of them. A great example that this can be accomplished. Also make sure to check out Colin’s blog for more WinRT goodness. A list of the “standard” .NET types that are available in WinRT as well. Andy goes through building a physics-based game for both Windows 8 and Windows Phone 7. Also check out his Physics Helper library for WinRT. Visual comparison of how much overlay Silverlight 5 and WinRT has. A follow-up to the link above with a comparison of namespaces, members, types and differences between SL5 and WinRT. This is an amazing list if you want to get into the details when reusing code between the two frameworks. A quick list of of tips when porting from Silverlight to WinRT. Talks about some of the issues with Dependency Properties in Windows 8. I already briefly touched on this, but this goes a lot more in-depth. If I find more, I’ll add them here, or feel free to mention any other good resources in the comments below. Here's something that's actually NOT different in Silverlight (but it's different from WPF as it has always been). Here is what IS different though: You need to set the build action of \Themes\Generic.xaml to "Content". It won't work without it. Also note that when you add Generic.xaml to your project, it will also get added to App.Xaml. I assume this is a bug in the current release, but you will have to go and delete this entry, or it won't work. In Silverlight and WPF you will often use the Dispatcher to return from a background thread to jump to the UI Thread. This is required when you need to update your UI, because you’re not allowed to touch the UI from anything but the UI Thread. The Dispatcher method has changed slightly in WinRT. It’s also now of type “CoreDispatcher”, instead of just “Dispatcher”. UPDATE Feb. 29, 2012: As hinted at below that this would happen, this blogpost on dependency properties is now outdated. Since the Consumer Preview of Windows 8 released, dependency properties now work exactly like they do in Silverlight and WPF. Declaration of dependency properties has changed in the WinRT. This is a temporary change and will go away when WinRT hits beta, but still good to know if you start prototyping on WinRT today. If you are a control developer this is probably one of the things you would have to change in the most places. Notice how the PropertyType and PropertyOwnerType is now strings instead of types! Also note that you don’t use the full type name for the system types. Ie. here you use “Double” and not “double” or “System.Double”. For the most part your XAML ports right over to WinRT. However an important change is how you register namespaces from your assemblies. I recently wrote a blog post series on how to share your code between Silverlight and WPF. With the announcements of Windows 8 at the //BUILD/ conference and the new Windows Runtime (WinRT) which can be built against using C# and XAML I thought it appropriate to start a new series on how to make your existing Silverlight/WPF code run on WinRT. I'm mostly writing this as notes to myself and hope you will also find them useful. Personally I've already found a lot of issues with porting code over. Not that there are significant changes, but the documentation is very limited at this point, and the gotchas enough to make you waste a lot of time on resolving this. Hopefully this will act as a resource to get it working for you as well. Keep an eye on this post. I'll post new links as I go along learning new things about WinRT. Generally what I have found is that with respect to XAML WinRT is more compatible to Silverlight than WPF, so expect it easier to use your Silverlight knowledge, and don't try and use WPF XAML features at this point. Things like DataTriggers etc. are not supported, and for the most part, the UI related methods in code are more similar to Silverlight than .NET 4 (note however that non-UI code is closer to the "original" .NET, since this is essentially the same CLR and compiler used). I won't go into too much detail about what this means for Silverlight and WPF. There's plenty of blogs and newssites that has their (over? )reactions described in detail. This series will really just focus on how to take your existing code and get it running on WinRT. Well technically this is not a WPF vs Silverlight post, but a SL vs WP7, but it still kinda belongs in this series. Generally the differences in the API’s between Browser Silverlight and Windows Phone Silverlight are pretty slim. However dealing with the phone can be quite different anyway. First there’s often less security restrictions on the phone to worry about. Secondly there’s a lot of phone specific APIs like sensor data, camera, contacts etc). The screen is also smaller so often some controls doesn’t make sense to have on the phone, or needs to have a separate layout to enhance the experience on this small touch-centric screen. Lastly (and very importantly) the small amount of memory, processing power and battery life means that performance is a concern. This often forces you to go down a slightly different avenue for your application, and for certain custom controls. For additional information on input differences between Silverlight on Windows and Windows Phone, see Input in Silverlight for Windows Phone (note that most touch events are promoted to mouse events, so code that relies on this will continue to work to some degree). Silverlight for Windows Phone supports a composition thread for certain graphics animation and access to the graphics processing unit (GPU). For information on optimizing graphics performance using this architecture, see Performance Considerations in Applications for Windows Phone and Graphics in Silverlight for Windows Phone (note that Silverlight 5 also introduces a composition thread). In Silverlight for Windows Phone, effects such as Blur and DropShadow are not supported. Isolated storage on Windows Phone does not enforce quotas to restrict the size of isolated storage for Silverlight-based applications. The default quota size of 1 MB does not apply. (however there’s still a 2Gb limit on Isolated Storage for WP7, or less if you run out of space). Manipulation events that Silverlight doesn’t have (well technically they are there but throw a not supported exception), are the same as in WPF, so WP7 has better touch closer to WPF than Silverlight.